While the overhead wires were being repaired, the damaged section of overhead wiring was by-passed using the adjacent overhead normally used by trolleybuses travelling in the opposite direction. About 50 yards of overhead had been damaged by the de-wiring of the booms of a earlier vehicle. Perhaps almost un-noticed in the background is the overhead wagon crew walking along the pavement with a bamboo pole ready to switch the poles onto the correct wires. And to the right do we have an original 'eddy boy'? Without Sunday trading in the early 1960's shopping centres were very much like a ghost towns. 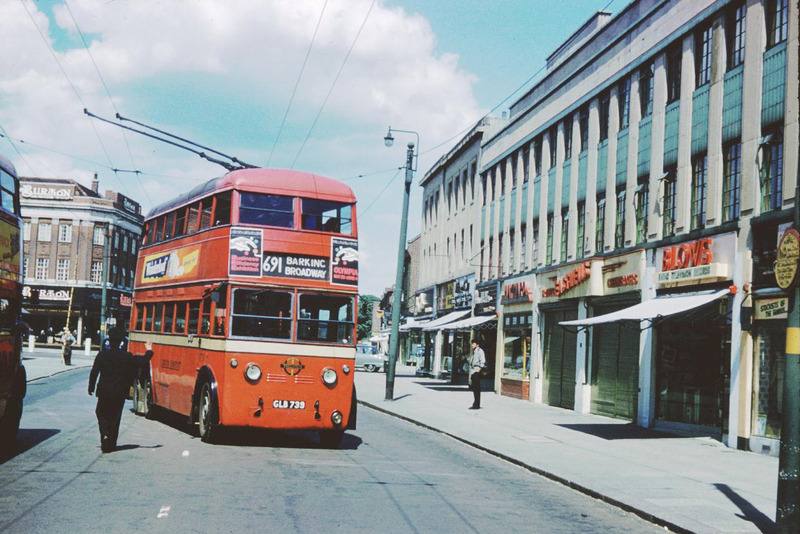 I was born and bred in Barkingside, and my Dad, [sadly no longer with us] was a trolley bus conductor on the 691 Route. Seeing the pictures of Barkingside when I was a boy is excellent. Picture 152 is the High Street [Incidentally the only "Street" in Barkingside, all the others are roads, or avenues or gardens] looking roughly from where the Police Station now stands. The Parade of shops on the left, housing Burtons, is on the corner of Freemantle Road, which becomes Clayhall Avenue once you pass Ilford County High School. It Links up with the Woodford Avenue to the South. The road on the right, [where the green car is turning from] is Baron Gardens. Both Baron Gardens, and Freemantle/Clayhall Avenue are extremely wide roads, and this was to be a link road to London's new airport, which was originally scheduled for Fairlop Plain. Plans were abandoned after Stanstead was chosen. An RAF station was situated there during the war. If you stand in the same position today and took another photograph, you will find that only the shop names have changed. I was also born and bred in Barkingside [still live there] and furthermore my Dad was a trolleybus driver on the 691 route. He unfortunately passed away three years ago. My Mum was also born here, my grandparents and great grandparents but believe Barkingside is nothing like it used to be which is very sad. Picture 152 shows one of the diverted South African order. I seem to remember that some at least of the diverted SA vehicles did not have battery maneuvering equipment, unlike most or all other London trolleybuses. Hence perhaps the "internal batteries" could not have been used and the driver maybe had no choice about running 'wrong line'. Regarding battery operation, I have seen London trolleybuses operating at 5 to 6 mph - I had to trot to keep up - on battery on the level unladen and as much as 15 to 20 mph going down Barnet Hill! Towards the end of the life of the system, I gather that the batteries on some trolleybuses were much better than on others. Also, of course, the driver had to remember to operate the motor-generator set [except on the Q's] to keep the batteries in a good state of charge. Often the source of misconceptions is the effect of polarity on traction motors. Many people assume that traction motors work like the small electric motors often found in, for example, model electric railways i.e. the motors have permanent magnets to provide the magnetic fields within the motors. These model motors are polarity sensitive - reverse the polarity of the supply and the motors reverse their direction of rotation. Traditional DC traction motors have electromagnets to provide the fields. These motors are not polarity sensitive, because reversing the supply polarity reverses the direction of the magnetic fields at the same time as the current through the motor reverses, cancelling out the effect of the polarity reversal, and the motors continue to rotate in the same direction. To reverse these motors it is necessary to reverse the relative connections of the armature and field windings - done by a switch(es) under the control of the driver. The latest trolleybus technology [e.g. ALSTOM's ONIX range] is based on AC induction type motors. The motors are three phase and their direction of rotation is determined by the relative sequencing of the three phases. The AC supply to the motors has to be provided from the DC overhead line supply by some very complex software driven [microprocessor controlled] electronic inverters, based on Insulated Gate Bipolar Transistors, or IGBTs for short. I don't know how this type of technology achieves insensitivity to supply polarity in trolleybuses [it would not need it in a light rail system, where one side of the supply, the track, can be guaranteed grounded]. I suppose it must involve extra complexity in the electronics and the software; I don't suppose it comes automatically in with the technology, as it does with traditional DC traction motors. Traditional British trolleybus equipment was not sensitive to polarity [or to grounding / floating] or to the exact voltage of the supply - intrinsic features of the relay / resistor / dc motor technology employed. No changes were required to operate abroad. Similarly, traditional European trolleybus electrical equipment, as far as I am aware, is not polarity or grounding /floating sensitive. I would be very surprised if any trolleybuses anywhere were polarity or grounding or exact voltage sensitive. It would for example, be impossible [or difficult - crossed trolley poles, or dangerous - operators putting poles on the wrong polarity conductors] to operate trolleybuses 'wrong line' to get past obstructions if the equipment was polarity sensitive. Also for safety reasons, trolleybus equipment has to be fully insulated / fully floating. Unlike a railed vehicle, there can be no reliable grounding point on a trolley vehicle, because of the rubber tyres. I suppose to be very pedantic, one could say that no changes were required to operate, but re-labeling of some electrical equipment I suppose might be / have been required. For example, the two circuit breakers [located generally over the driver's head] were usually labeled positive [+] and negative [-] in British trolleybuses. My impression is that all European long established trolleybus systems operate on about the same, approximately 550 Volts DC, with the exception of the one remaining 1,000 Volt DC system in Switzerland. The new systems e.g. Nancy seem to use 750 Volts. There seem to have been no [electrical] problems transferring London vehicles to Spain and there are a number of foreign European trolleybuses operating in British trolleybus museums now. I don't know whether the Spanish systems grounded or floated their trolleybus overhead. Both arrangements were used in London. Where trams shared the same overhead / power supplies in London, the overhead had to be grounded. It did not make any difference to the trolleybuses. Trolleybus electrical equipment has to be very [electrically] robust and able to withstand, for example, sudden breaks [on insulators], lightning strikes, polarity reversals, etc. - problems not experienced by equipment on battery vehicles. On any traction supply, the actual line voltage at any one place, from moment to moment, must vary considerably from the value at the substation. It would depend on the distance from the substation [up to perhaps a couple of miles] and whether other vehicles in the same electrical vicinity were drawing power or even perhaps regenerating. I have been told that on the London system, line voltages could go up to as much as 1,000 volts when a bus was attempting to put regenerated [braking] power back into the overhead. All British trolleybus systems [1911 - 1972] operated at a nominal supply voltage of about 550 Volts DC - the same as British tramway systems which were all governed by the same legislation [the legally permitted maximum, as measured at the substation, was 650 Volts]. My impression is that about 550 Volts DC has been, with one or two exceptions, like two 1,000 Volts DC lines in Switzerland, a world standard for most of this century for both trolleybus and tramway systems. In Britain, and I believe, elsewhere, the convention was/is that the conductor nearest the kerb [on the left in Britain] was grounded [if grounded at all] and the other conductor [the right hand in Britain] was at about 550 Volts. Many British trolleybus systems 'floated' their trolleybus overhead i.e. there was no ground connection and, theoretically, one could not get a shock by touching either conductor and 'ground' at the same time. In these situations, the wire nearest the kerb [on the left in Britain] was held at about -300 Volts and the other wire at about +300 Volts, giving a potential difference between the wires of about 600 Volts. The London system did this [once the trams had gone]. I was really interested in picture 152 of the trolleybus outside Eastwell's in the High Street. Though I don't remember the old 691 I certainly do the 169 as I travelled to school on them and in 2004 to mark the withdrawal of Routemasters one operated on the old 169a route and I took some pictures of it before making a journey to Newbury park on it - last time would have been in 1977! The shop which took over from Eastwell became the Dixie Warehouse and only closed recently but as you say the shops are different but the buildings remain, albeit shabbier. I was born in Barkingside and have always lived there and well remember the buses as I began using them to and from school in 1967. Every route was RT then though the RM would appear on the 169/a at weekends - happy days! Great photographs of a world now sadly gone, even on a Sunday the roads would never be this clear and of course yellow lines and road markings everywhere! Would just like to say how fascinating I found your pictures. I've lived in Barkinside all my life and though I'm only 45, I don't remember the trolleybuses. I recognise nearly all the places especially Barkingside High Street. Many thanks for putting them on the net. Very interested in your information on Barkingside trolleybuses. I lived in Sydney Road, Barkingside from when I was born in 1939 until 1972 so remember the trolleys and their demise very well. I also remember the complicated cross road at Ilford Broadway and the turn round loop around the old Super Cinema, later C&A but now I think Woolworth. Also the depot at Perth Road with a turning circle. Used to travel on the 691 from Barkingside to Ilford and Barking and changing on the 693 to Chadwell Heath or the 663 to Stratford. I am told that was a short lived 692 which ran from Barkingside to Chadwell Heath and I know the cross roads at Ilford Broadway was wired for this possibility. My parents remembered the trams which ran only as far as the Chequers as unlike trolley buses they were able to run in both directions so did not require the turning circle which was constructed for the trolleys at Fairlop Oak.